Conducting research outside of the classroom strengthens your transferable skill set, resume, and record of achievements. 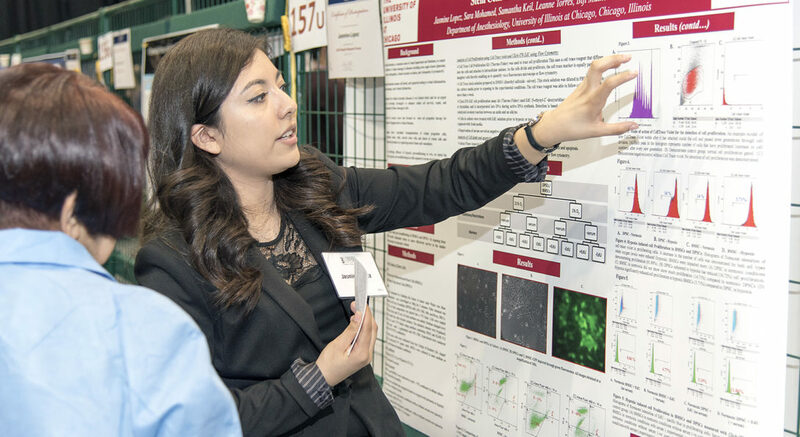 To support students in their endeavor to develop critical thinking, problem solving skills, and intellectual independence, undergraduate research assistants selected for LASURI receive an award of up to $1,250 per semester, pending satisfactory progress. Most participants are approved for two-semester projects and therefore receive up to $2,500 over the course of the year. Most faculty mentors receive a fixed amount to cover direct costs associated with the project. We reach out to faculty mentors at the beginning of each term during a student’s LASURI award period. The transfer of funds to students is dependent on faculty mentors’ confirmation that the student is meeting expectations of the program. Research expense support will be transferred to the faculty member after this confirmation process during the student’s first term of participation. There are three types of funding available: LASURI, Kaufman, and Thelander. All are considered awards that may impact the type or amount of aid a student is eligible to receive. If you receive financial aid, please consult with the Office of Student Financial Aid for information on how the award will be integrated into your existing package. LASURI staff will not be able to answer questions related to aid; please direct all inquiries to your Financial Aid Counselor. Payments will be made at the beginning of each semester, pending confirmation of full-time enrollment and satisfactory progress, as determined by the faculty mentor. Be aware that payment transfer process can take a couple of weeks. Please do not ask LASURI about the status of your payment until after the fourth week of the term. Faculty mentor funds will be distributed around the same time the first payment is made to the student. The award notification will specify the amount of research expense support you will receive (typically $500). Research expense funds will be released to your department in the third week of your mentee’s first semester of participation in LASURI. The total research expense support provided will be disbursed in this single, lump-sum transfer. These funds can be used for any expenses related to the research project, including laboratory reagents, equipment, study participant compensation, student conference travel, books, etc. Your department administrator can help you with the procurement of items; you will follow the same processes as purchasing any other university property or traveling on any other university business. Items purchased with these funds remain university property. Non-LAS faculty will be asked to provide account information for their home department. If you have any other questions, please contact LASURI. While conducting research, students can expect to meet consistently with their faculty mentor throughout the semester and to spend 6-10 hours per week working on their research project. Once you have completed your research project, your final task is to present your work in a public forum and submit an abstract to LASURI. With permission from their department, LASURI research assistants may (but are not required to) register for independent study credit hours with the faculty mentor during the period of the award. LASURI research assistants are required to present their work at the UIC Student Research Forum. You must register yourself to present your work at the Student Research Forum. Deadlines are typically in late March for the mid-April Forum. The available spaces fill quickly, so early registration is strongly recommended – keep an eye on the Forum’s web site for announcements regarding the coming year’s event. The Office of Undergraduate Research, Office of the Vice Provost for Undergraduate Affairs and the Honors College typically offer a series of workshops in March to help you prepare for the Research Forum. These are open to all UIC students and cover topics such as how to prepare an abstract and how to prepare and present a poster. Information on these workshops would also appear on the Forum’s website. If you wish to present somewhere other than the UIC Student Research Forum (such as national undergraduate research conferences, professional conferences, department colloquia, etc. ), your faculty mentor must approve the venue and notify the LAS Associate Dean for Student Academic Affairs. Acknowledging the Funding Source. In the public presentation of your research, please acknowledge the funding source in your public presentations. You might include something like: “This research was supported by the UIC College of Liberal Arts and Sciences Undergraduate Research Initiative (LASURI),” or “This research was supported in part by the Howard L. Kaufman Undergraduate Student Research Award.” If you’re unsure which fund provided your LASURI support, just check your original award notification. Once you have presented your work in a public forum, your last task is to submit a final summary of your research goals and outcomes. Instructions will be provided during spring semester. We also welcome photographs of you engaging in the research and/or presenting your research; the document offers some details about that and the preferred naming convention for any jpeg files you may choose to send.